Vista and Nvoicepay integration delivers immediate process improvement, cost savings and strong bottom line impact. "Integrating with Nvoicepay will simplify the payment process to a single click. These innovations are how we continue to transform the construction industry with cutting edge technology," said Viewpoint Chairman and CEO Manolis Kotzabasakis. 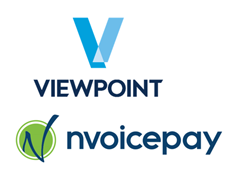 Viewpoint, the established leader in integrated software solutions for a contractor’s office, team, and field, is pleased to announce a partnership with Nvoicepay, the leader in payment automation software for the enterprise. Both companies are focused on bringing innovation to the construction industry and delivering immediate and measurable customer value. Nvoicepay, providing electronic payments for the enterprise since 2009, offers strategic cloud-based payment automation solutions that go beyond simply reducing costs. The company’s innovative solutions enable customers to pay 100 percent of their invoices electronically – customers will be able to simply select invoices for payment in Vista and Nvoicepay optimizes payments to pay suppliers in the most cost-effective method. Unlike bank ePayment offerings, Nvoicepay continuously enables suppliers for electronic payment and maintains supplier information as it changes over time, relieving accounting personnel from this burden and ensuring accounting teams can pay all of their suppliers electronically. “We are proud to partner with Viewpoint. It’s exciting to have a partner that is as passionate as we are about transforming processes, companies, and even entire industries through technology. Our solutions change the incredible effort that often goes into paying suppliers into a simple automated flow and we immediately reduce accounts payable costs by 75 percent. The ROI along with the simplicity and efficiency of the process really speaks for itself,” said Nvoicepay CEO and founder Karla Friede. Initial integration is expected in the coming weeks with full integration available Spring 2018. Viewpoint provides innovative construction-specific software solutions to the global construction and capital project industries. Viewpoint provides the tools these industries need to improve project profitability through better visibility, risk management and real-time team collaboration. Viewpoint solutions address the full construction life-cycle, from planning/bidding to construction and facilities maintenance. Headquartered in Portland, Oregon, USA, and with offices in the UK and Australia, Viewpoint has become the technology partner of choice, with customers located across the globe in more than 28 countries. These customers include more than 40 percent of the ENR 400, and more than 30 percent of the ENR 600. For more information, please visit http://www.viewpoint.com. Nvoicepay transforms the massive and expensive effort that goes into paying suppliers into a simple and automated solution. For over 2,750 customers, we optimize electronic invoice payments for enterprises with intuitive cloud-based software. In addition, Nvoicepay provides comprehensive supplier services through our Payment Command Center and the highest level of security in the industry. By automating all payments, Nvoicepay unlocks resources and immediately reduces accounts payable costs by 75 percent. Learn more at http://www.nvoicepay.com and follow us on Twitter at @Nvoicepay.